This bad boy is one of the finest sport fishing vessels in Puerto Vallarta. 36 feet of fine Luhrs quality, fully equipped for the biggest game fish, including marlin, tuna, sailfish, wahoo, and more. If you're looking for a top-quality fishing expedition, you've met your match. We head for the famed fishing grounds of El Morro/Marietas (8 hour trips), Corbetena (10 hour trips) and El Banco (12 hour trips) where the fish of lore are found. See More. Includes: 36' Luhrs Convertible Yacht with A/C, All Fishing Equipment, Snorkeling Equipment, Bait, Bottled Water, Ice, English Speaking 2-Man Crew, Fishing License. 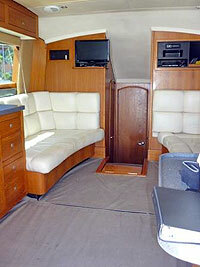 SEE OUR 35' CABO INSTEAD - EVEN NICER! TO ADD A TRIP TO YOUR CART, CLICK "BOOK NOW"